Here’s a tip to keep in your back pocket, you can use a metal file to adjust your resistors. [Gareth] shows off this technique in the video after the break. A metal file is literally all that you need to do some fine tuning. Just make sure you’re starting off with a carbon film resistor as this will not work with the metal film variety. His example shows a 10k resistor which is reading just 9.92k on his multimeter. But he needs precisely 10k. After getting through the protective layer he makes just a couple of passes with a small file, each time adding about 20 Ohms of resistance. Now he does mention that excessive deep cuts can hurt the power rating of the resistor. But this certainly isn’t damaging it if done correctly. It turns out this is how they are tuned at the factory. One possible use he mentions is trimming the balance on a hacked servo motor. Great trick ! I think I’ll use this trick in some of my 5% resistors. It’s a good emergency hack, but if you are planning a project from start to finish, don’t plan to do this. Much better to get a trimmer resistor that covers perhaps 5% of the resistor value, and get a 1% resistor that is a few percent less than your target. If you’re trying to simply tweak 2 or more resistors for exact matches, get SIP or DIP resistor networks instead. The process by which they are manufactured guarantees resistor matching at the few hundred parts-per-million level, better than you can get with a 3 1/2 digit DMM. Just one question, will this reduce the life/function of the resistor, by opening it to the air? Shouldn’t you cover it with some varnish or somthing after adjusting it? Still pretty smart. Yes, it reduces resilience of the package and therefore harms the resistor. A fingerprint on the open part will eat itself through the carbon. Moisture will change the value too. As a quick hack it will surely work, but it should never be a long term solution. When you need to match a pair, absolute value is only a part of the equation. The dynamics are also important (f.ex. temperature). Can we put some nail polish on to avoid that? How can I trust my multimeter to know its really 10k? Good to know. But what if the value is too high to start with? Then you add another resistor approximately 10 times higher in resistance in parallel. e.g. R1 = 112 ohms, add a 1.00 Kohm resistor in parallel (R2), results in 101 (rounded) ohms. yah this would have been nice to know when i was working on some filters for a class. Buy 1% resistors if you need 1% parts. The carbon film part will drift up to 400ppm/*C and can be off by this 80 ohms adjustement after a 20*C change in temperature. 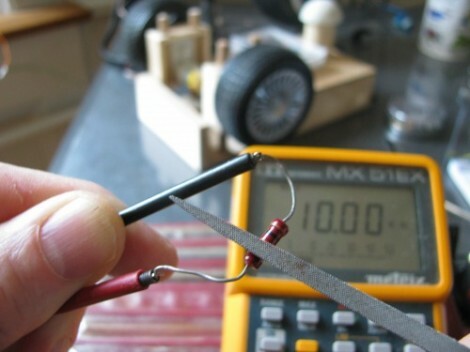 Many resistors change value from bending the leads. Measure again after forming to insert in the PCB. You may be surprised with the results for some brands. I have to agree with zhen here. If your circuit wont take 9,92k instead of 10k, then the temperature drift will likely also be a problem. If you need better than 1% accuracy, just use two resistors in series. Pick a primary that is slightly below what you need and bump it up with a low value resistor. If you find one that is bang on, simply jumper the second resistor. Now that is good advice. I don’t stock many 1% resistors, so I often use this trick with 5% resistors when I need better accuracy. Measuring the first, larger resistor with an ohmmeter to see what the second, small resistor needs to be is certainly quicker and less fiddly than going at a resistor with a file! And if a fixed (but accurate) resistance is needed, don’t use a trimmer. They’re larger, more expensive, produce more noise, and can get flaky as they age. Another trick is to use a series/parallel network. If you put two 1k resistors in parallel, you get 500 ohms. If you put two of those networks in series, you get 1k again. Thing is, you’ve averaged out the errors in the components, so the network will almost certainly be closer to the nominal voltage than any single component. You’ve also improved the power rating and reduced the thermal drift. Also, I second the idea of buying 1% resistors.. metal film 1% from Mouser costs $4 per hundred. Why not parallel? Then you start with a resistor that is too large, and reduce by adding big resistors. The situation is exaclty dual, except that you don’t have to bridge the second resistor if you find you don’t need to adjust…. The math is a bit more difficult though. Way cool!!! I’m totally going to use this! Previous posts are right concerning stability. A bit of nail polish or conformal coating over the resistor might help. Also to consider is the accuracy of the DVM. Is indicated 10k really 10k ??? this reminded me of those old OLD monitors where the focus always drifted _just_ out of range. replacing the variable resistor with a new one of BETTER reliability solved the problem. lots of ppl just added/changed? a resistor so var. R. was in range. This is a really old trick. I knew you could do it with regular (old) carbon resistors, but I didn’t know you could do it with carbon FILM. I tried the metal film, and they didn’t work. Because the “film” is on a ceramic “tube” and it’s not easy to file. It’s OK to do for a one off. But everybody should have several standards around, and salvage always has good parts. the metal film ones are laid out like a ribbon around the ceramic core. the carbon ones are laid out like a blanket around all the ceramic core. So you just have to careful with the metal ones to not break the ribbon entirely. Also, finally something on this site related to Hacking and not redbulls. redbulls taste like sugary piss. Just by accident, I currently have two 10K ohm resistors in front of me now which are accurate to better that 0.01% and under 5 ppm tempco (by ESI). They are made as resistance wire wrapped around a card until it comes to just under 10K ohms. It is fixed in place with lacquer and thermally aged and cycled for 2-3 months. It is then connected to a high accuracy resistance bridge and gently sandblasted with an Airbrasive, a tiny pen sized tool. The abrasive used in non-conductive, so the operator can just watch the bridge while he is blasting away tiny amounts of resistance wire over a large area. No power dissipation limited areas are created. The .01% accuracy spec tells you how easy it is to pull up to your set point, slow down, and stop right on it. The card is then potted into a small plastic cup. And that’s how you really dial ’em in tight! Reminds me of the resistors seen in old Fluke meters/bridges. I can see robot platform at the back. robotic homemade oscilloscope made with filled resistors? You can also trim Ceramic Caps with a nail clippers. Works great for tuning circuits just right to get your lab done on time. …if you need a file *and* a multimeter, which you do. So that was literally inaccurate. How does it work that the component *gains* resistance when you file stuff off of it? The coating is not very likely to be super-conductive, so what’s the science here? It gains resistance! The resistance goes up! Or the other way, it loses conductivity. If you make a wire thinner, the resistance increases, right? Even if it’s a carbon “wire” you thin with a file. I think you got your thinking upside down for a minute! Seriously, he is using a $75 multimeter and expecting to get accurate results? …but feel free to use Monster Cable on your probes to get a better reading. Don’t forget to gold-plate the battery snap as well. Yup, green markers increase the resistance making them shiner. Shiny means more laser! No doubt because we were all having such trouble reading it here. …and HAD deleted the original, leaving a “WTF is he on about?” post. I attempted this last night, adding about 40 and 60 ohms of resistance to create 10.0. After, I added 2 layers of superglue to protect the carbon. Today the resistors read 10.08 and 10.03. It looks like the drift is harder to prevent and faster than expected. this technique can be used to correct balancing discrete differential amplifiers! Great tip, but better discussions. The only thing this is good for is to demonstrate to the ignorant how ‘brilliant’ you are. 5% resistors are guaranteed to remain within 5% of their stated value under normal operating conditions. This is after taking their temperature coefficient into account. 1% resistors are, similarly, guaranteed to stay within 1% of stated value under normal operating conditions. Generally, 5% resistors have copper leads plated with tin. 1% resistors often have leads plated with a silver or gold alloy. There are much greater differences between the two than nominal values. This is older than you think. When carbon resistors were made in the 1920s the values were typically -20% +50% and the bigger ones actually had a flat on one side for filing. You then varnished the surface and stuck a piece of paper over this with the actual value written on it. I’ve actually seen these in situ (as a very small child). Need A Small Keyboard? Build Your Own! Nh4x4jeep wrote a comment on PCB Drill. Steve Pettinger liked Big 7 segment display. Steve Pettinger liked ESP cookbook. Beauregard Slim liked Vintage film viewers as RetroPies. Arnold Bagabaldo liked ESP cookbook. Bud Bennett has updated the project titled Precision Voltage Reference. Stefan De Raedemaeker started following KiCad and FreeCAD Hack Chat. Feri liked Big 7 segment display. deshipu wrote a reply on PewPew Mini.